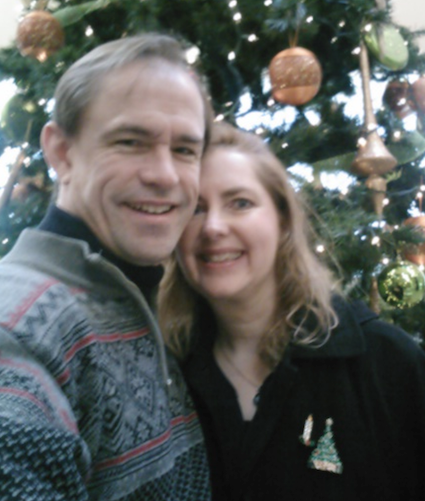 Rich & Joyce Swingle: Have a blessed Christmas! We hope that you and yours have a blessed Christmas and a wondrous New Year! This year has had some exceptional highs and lows for us. The deepest valley was resigning from The MasterWorks Festival after serving on the faculty for 16 years and directing the theatre program for ten. Joyce also had served as director of pastoral care for six years. Though it was a difficult decision we know that the Lord was leading in it, and we are planning to use the connections and experience we've gleaned after being a part of 17 film projects since 2010 to work on our own. Details to come. Two of those films are coming to theaters on Valentine's Day (Princess Cut: I play suave realtor Nigel Livengood) and April 6 (Beyond the Mask: I play Dr. Bonneville). Click on those titles for more information, and for Beyond the Mask they're looking for people to help promote the film and are offering paid and volunteer positions, and volunteers earn an iPad! I've posted their new trailer below. I also do not feel called away from teaching, and I will be doing that and coaching actors at The Rocky Mountain Christian Filmmakers Camp this summer. Registration is opened, and there are only a few places left, so apply as soon as possible. It was through this camp that the feature film In His Steps was produced. I was just there as an actor that year, playing John Gray, who runs a soup kitchen. 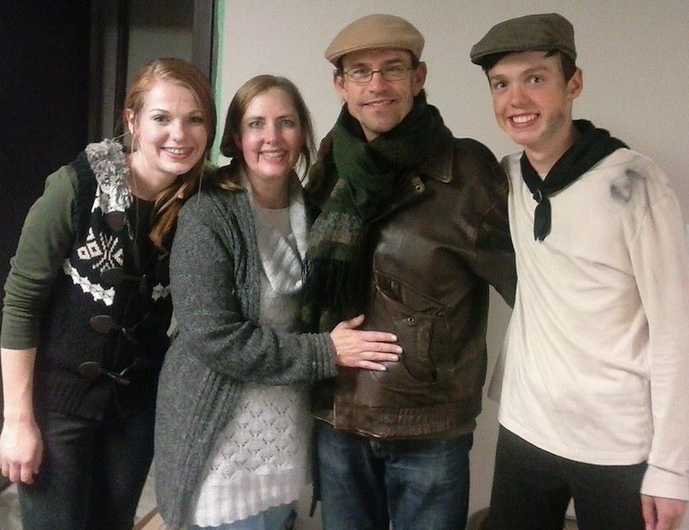 This summer we helped our students audition for a live project, the feature film Mayflower II. 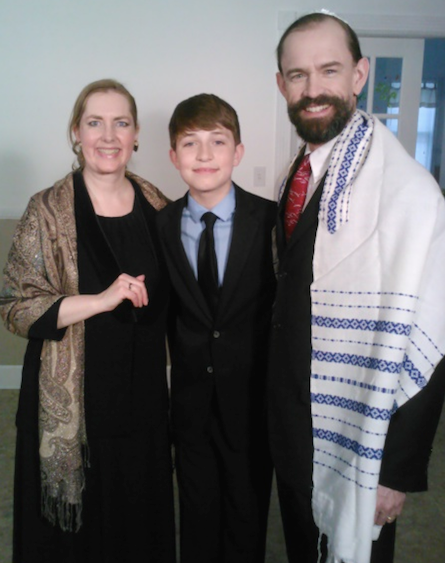 One of our students was cast in the key role of the son of the characters played by Joyce and myself. One of his scenes led up to my favorite scene in my 19-year career! Speaking of screen children, when Joyce and I went through pre-engagement counseling (something we highly recommend!) we were asked all sorts of things that you just don't naturally bring up as you're getting to know each other: spiritual background, denomination, political affiliation, etc. We were connected on so many levels, and the session was going so very well that I thought I'd throw in a joke when the counselor asked how many children we each wanted. I said twelve. Joyce just about fell out of her chair! Though we haven't had any children of our own, it just dawned on me that we've now had 13 screen children! We've played husband and wife in four films. In Indescribable we had nine children, in The Unexpected Bar Mitzvah we had one, in Rather to Be Chosen we had two, and in Mayflower II we had one. I hope in the future we'll have many screen grandchildren, but we'll be putting the pressure on casting directors (far into the future), rather than on our screen children. This was a busy traveling year with numerous performances and workshops in 17 states, Sochi, Russia, during the Olympics, and three provinces of Canada (a personal record for me). We're planning to take a team of performing artists to Rio de Janeiro for the 2016 Summer Olympics. If you're interested in joining us, and if you're on Facebook, click here. If you're not on Facebook be sure to watch your inbox for the announcement that registration for the trip is open. Joyce continues as counselor and lead pastor of Westchester Chapel Church of the Nazarene in White Plains, NY, where we've seen profound connections with each other and with the Lord. You can hear her sermons at www.WestchesterChapel.org/JoyceSwingle and the few that I've had opportunity to share at www.WestchesterChapel.org/RichSwingle. I just submitted to play the role of a lifetime on a $16M project. 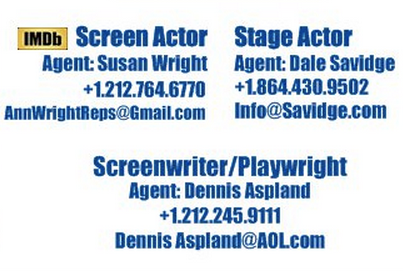 If you have a moment, please visit www.IMDb.me/RichSwingle and Like it in the right column. Even if you're not on Facebook, just visiting the page will give it a boost. If you have the time (took me about five minutes), it would be great if you could also visit and Like all the projects in which I’ve performed. If you do undertake that, please make it a time of praying for those projects and others that the Lord wants to birth through his people as he raises us up to tell His stories with excellence. May the Love of Christ grow in your hearts and lives this Holy Season, and if you don't celebrate Christmas or see it just as just a season of obligation, consider inviting Christ into the manger of your heart. It will radically transform the way you see Christmas and the world. Find out more about that at www.RichDrama.com/MyPassion. Click here for the highlights of the year Facebook picked. And you can browse our blog for more. If you're still checking off your Christmas gift list, some of our films are available for instant download: www.RichDrama.com/Films. This list is only updated a few times a year. If you got this far you may be interested in more frequent updates, and you can sign up for those here: www.RichDrama.com/Updates. Hi, I pop over to your blog every now and then - The first film I've seen you in is Indescribably. Thank you for sharing your heart in this post. It is so refreshing to see a husband and wife walk together in their callings spiritual and vocational (even if that has spiritual impact too). Be encouraged. I'm sure you have touched more lives than you know doing the Master Works studio and know that God has big and awesome plans for you both. Have a blessed 2015. All the best with your endeavors!